There’s no way to sugar-coat this: the public trust in charities has fallen. 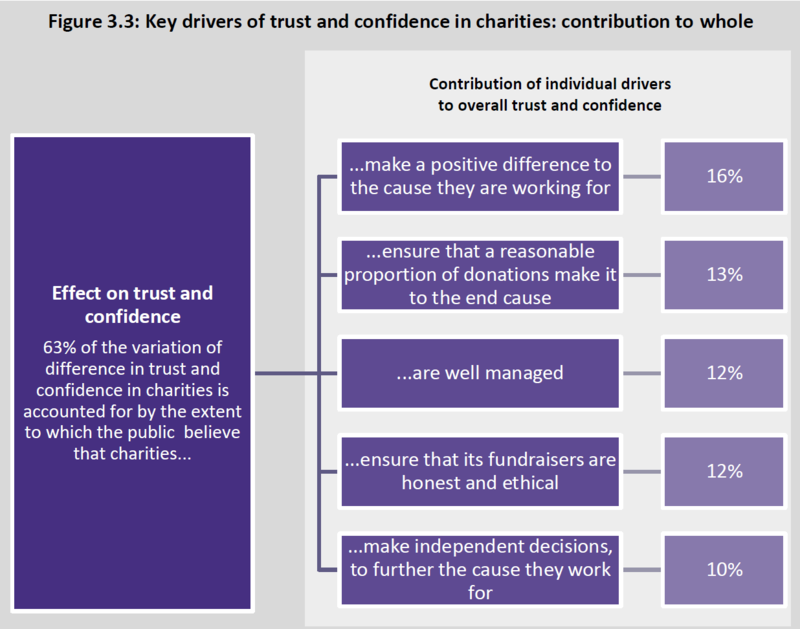 Today we’ve published the latest research in our series tracking public trust and confidence in charities since 2005. It shows public trust and confidence in charities has fallen from 6.7 in 2014 to 5.7 this year (where 10 is complete confidence and 0 is none). Given the very difficult year we’ve had, this fall – the lowest recorded trust score since 2005 - was perhaps to be expected, perhaps you may even feel it could have been worse. Some people will tell you that it’s a blip, driven by media; others may say that measures of trust don’t tell you very much in comparison with hard data about donations or volunteering. For me, while it’s not a surprise to see public trust has fallen so far, it is a concern, and one that needs a strong and focused response from charities and all those who have an interest in upholding trust in charities. In a time of economic and political turbulence, charities undoubtedly have an important role to play in building community cohesion and serving, and speaking for, people in need. The legitimacy of this role rests in part on the public’s confidence. Looking beneath the disappointing top line figures, this report tells you a lot about the drivers of public trust. If you know what matters to the public, and you act on it decisively, you can regain trust – we’ve seen that in other sectors. So what are the reasons that trust in charities has fallen, and how can we rebuild it? The public wants to see charities explain more and account better for how they manage and spend their money, they want to see honest and ethical fundraising, and they want to know that charities are making a positive difference to their causes. We can also see that when people know more about a charity their trust and confidence in charities generally increases. So we have a clear road map for regaining trust: make connections with the public, meet high standards for raising and managing money, explain all this clearly, and show how you are making a difference to the cause. Many charities and charity leaders are already responding positively to the challenge to respond to public concerns about accountability, transparency and fundraising. But there is certainly more work to do. Charities need to get the message out to the public that things are changing, and show that they care about winning back public trust. As for the Charity Commission, we know that the actions of a few can affect the way all charities are viewed. Our role in tackling abuse and bad practice supports public confidence. But we can and will need to do more to respond to what this report tells us about the drivers of trust – including that awareness and confidence in us has also dropped. Certainly we can do more to improve and promote the data we hold on charities, to help people understand more about the work of individual charities and the sector as a whole. We can also do more to help the public understand our work and the modern charity context in which we operate. The research shows that the public values charities, with most (93%) feeling that charities play an important role in society and nearly two-thirds (61%) agreeing that charities are trustworthy and act in the public interest. If you are a small or UK-only charity, you may not be surprised to hear our research found people are more likely to trust small charities (57%) than large (34%) and they are more likely to trust charities that operate in the UK only (61%) than operate internationally (31%). Might the research be wrong? It’s based on interviews with 1,085 people, and Populus repeated a shorter survey a month later with 914 interviewees to see whether it had been affected by a media story current at the time we were conducting the research and had sprung back – it had not. Our findings are in line with many other polls and surveys of public trust conducted in recent months, while our colleagues at the Scottish charity regulator OSCR published research yesterday on the picture in Scotland, also showing a decline in trust albeit a smaller one. There’s much more to consider in the research, and a wealth of supporting data. You can read the full research here and we’ll explore some of the key issues in future blogs. As ever, comments welcome below the line. Confidence in charities would be raised by the Charity Commission fulfilling its role as a regulator in respect of organisations which operate against the public good. Charity Commission has dragged its' heels thereby allowing charities to continue abusing the goodwill of the public. When it becomes public knowledge that a charity is paying several directors over £150k a year...it is generally deemed unacceptable. This is going on all overthe place . The charitable sector is self-serving and not self-funding. The dishonesty of fund allocations, the long lunches, the failure to deliver what is on the " packet" .i am unpaid but frankly the research I have done makes you lot look pathetic. I made a complaint to a huge charity just a couple of weeks ago..totally valid. They have so far sent me two letters of two sides of A4... Just wriggling out of the need to take any responsibility. Meanwhile people die. The charitable and voluntary sector has become an evil scam creating the very symptoms by which to fill the pockets of those who care less for anyone or anything other than their own cravings for either romance or finance...please include the Church of England in this rant. Covert cover ups didn't just stop at sexual improper behaviours. Religious institutions like sikh temples so on making tons of money going in pockets of individuals hence the fights. What can you say charity commission itself closed shop public have no access see if you can phone. And the other one you can find on our website is a voice mailbox for trustees reporting serious incidents, and is available 24 hours. I and others are begining to think that is just what Hightown Housing Association Ltd has been doing for sometime. What hurts most is they call themselves a Charity when they are seeking sympathy for being challenged about bad practice. The Charity Commission is continually "caught out" by the antics of some charities and the best it seems to be able to do is to give a slap on the wrists to miscreant trustees. Whenever a large charity such as Keeping Kids Company, falls foul of the law or public opinion it appears that the Commission goes through the motions of being seen to do something but in fact does very little. One sometimes wonder whether it is afraid to challenge trustees who are members of the Great and the Good! Most locally - based small charities are well respected as they are close to their beneficiaries and funders but the problem is the larger well known charities that seem to have real governance problems and the attitude that because they are big then the public will always fund them whatever they do! I am concerned about the small ones too. Unless they self report an income over £25000 they do not have to send in reports at all that can be independently inspected by the public. The Charity Commission contact process could be improved to help too. I recently (12th July ) asked for some clarification about rules governing the sale of land covered by a detailed conveyance. I had read your document cc28 and still was not clear as I am not a solicitor. I received a reply saying my request would be responded to 'providing your enquiry falls within our regulatory remit.' How do I know if it falls into any regulatory remit? How long will it take for a response to be issued if it does? At the moment I am just left hanging, not knowing if I ought to be taking some other action. I fear that this charity is going to break the law but I can't challenge them without being sure. Your site and contect process does not help us report worries or rule breaking. Our contact centre will come back to you (15-30 days) but if the concern is urgent you may want to raise the issue with us now. You are spot on. The Commission basically says " if we decide we don't want to take action you won't hear anything". Not acceptable for a public body. All charities should be required to submit annual accounts and all charities with an income over £25,000 should be subject to a full annual audit. And charities should be assessed like the DIS-ABLED every year---and prosecuted for failing to produce accounts on time and book -keeping. If the DWP is cracking down on welfare scandals , then so should the Charity Commision on PUBLIC MONEY AND GOVERMENT MONEY that charities receive-- and I am not or ever have been a benefactor--and nor was my mother--and we were and are both disabled . Charities in our case have taken--but not given back. Public body duties under the Equalities Act. They aren't just landlords they are employers - large employers!! They aren't registered with charities commission and look to have turn over or 50million as year and rising. No one seems to regulate if they carry out charitable work - it appears they are commissioned for supporting indivuals and pay frontline staff only just above minimum wage. This can't be right ! !! But the Charities Commison informs me nobody regulates their "charitable works"
Regarding Charities--- I fundraise voluntary on my own---I do not really trust any of the MONEY that I raise and give goes to the people that really need it--- nothing in writing and told by one person it is none of your business where your money goes. Any complaints about abusive charity staff--not answered to or investigated-- A group of people that close ranks. Bad charity workers simply move from one charity to another charity--they are not vetted---rather like the Care Sector and Social Services---Poor people and vunerable people they target because they know they are probably scared and obvious targets for change of or leaving these charities a will---and with the abolishing of legal aid , even more of a target. In a previous comment you said I had serious concerns about charities--- The C.E.O of one has ",retired " the advocate who is unaccountable to anybody has "vanished" and the charity website is closed---the charity "workers have vanished" " Support Worker " vanished--- I doubt if my late mother was well off they would have treated her like they did. Charities know to play tricks--pressurise someone into donating and when you feel scared you say yes -- because there are two of them right next to you ready to deny it if you complain to the charity commission--so you walk away even more wary of charities--regarding the present trouble caused by two charities to me---well the Citizens Advice are handling my complaint and the Local M.P is being updated---but I for one cannot wait for the day when LAWS are brought in regarding the charity sector and the Voluntary Sector---and as I am dis-abled and declare my savings and as I was declaring my expenses when I was working as a H.G.V driver for an agency---Why should the Charity Sector be regarded as a Special Case . There are laws around the charity sector which charities must obey. If you have serious concerns about a charity, please get in touch with us https://www.gov.uk/complain-about-charity. A well known national charity decided to remove the right of members to elect trustees. Members had held those rights since the foundation of the charity in the 19th century. The trustees of the charity failed to inform members properly what they were doing at the EGM, so that votes allocated to the chairman by the naive trusting membership allowed the trustees to get away with it. The Charities Commission did not want to know about the deception. Members have been reduced to mere customers, for no logical reason. Many customers have been very angry and frustrated that there is nothing they can do about the change now. Some of them have stopped being involved with the charity. The charity is largely dependent on the loyalty and enthusiasm of groups of volunteers working for it across the country, so they have shot themselves in the foot. Actions like this make me distrust any undemocratic charity. You could stop bogus companies like this being set up and make them detail exactly who they paid grants to and what they intend doing with the rest of the money. I have belatedly visited this page (October 2016) and hope it is still active. I think that many of the public’s criticisms of the ‘charitable sector’ are correct. So many people are now gainfully employed in the charitable sector that it is perceived as a giant job-creation scheme, helping HMG to keep people off the dole and with many people (disgracefully) being paid £80-100,000 per annum or even more. These are not charities but businesses that have nothing to do with any ‘Voluntary Sector’ and I have personally had to change the destinations of my own donations to avoid them and to avoid charities where more than 10% of my donations are spent on staff. Can these organisations not find a retired banker or lawyer, for example, who’d like to give something back to society? If not, then they should scale down or split into smaller units, or fold. Why does the Commission tolerate this? Like many ordinary people, my wife and I have been involved as trustees in more than one charity for donkeys’ years and have never taken a penny for anything (and often made contributions). The same is true of all our fellow trustees. That is how it should be. The only costs are for accountancy and the Commission might think of setting up a network of ‘voluntary’ accountants who would do the work for little or nothing so that more money can reach its intended target. Mr Daljit Singh Dodd above rightly complains about access to the Commission: is the voicemail box you mention in your reply really a suitable vehicle for trustees or the public’s serious complaints? It's also fallen as the confidence in the CC has dropped. When they fail to investigate serious complaints when board members turn to them for help, after trying all other routes to hold people to account. Even acknowledging there is an issue but not wanting to investigate - and it's regarding thousands of pounds which have been "distributed" unauthorised. It's a process wholly ineffective with no help or support for those who want to make charities ethical or accountable. I am deeply disturbed by bad practice in this sector, but agree with the request that if you have specific examples of charities performing inappropriately then report them. As a board member of a small charity who has accounts audited every year, (by PWC), in each fund-raising country, I feel we are all being tarred with the same brush by some of the remarks above which are general at best and in some cases careless and undiscriminating. We work immensely hard to provide donors with receipts to prove where money in spent and to assure them it is spent where they requested. If you are raising funds and are not being treated with respect and/or not getting answers from a charity, then why are you dealing with them? You owe it to yourselves and the well-managed charities to respect your own time and effort and only put money where it will benefit the needy. Please do not continue to make general and discrediting remarks about charities as if they are all corrupt, because they are not. It is in everyone's interest to keep complaints specific, especially the people who really need our help and whose interests are greatly harmed by general remarks. The CC do not use their power effectively when asked to do so .they offer advice only . a charity encounters from time to time in their day to day management . I am working on a problem now that could be easerly resolved in that way . So the policy it's self is not working for many charities . The whole trust is Governed through the Chair and vice of the Datchet parish Council . There is a governing Document ,but the CC do not hold one .why ?